Tsola Akuya is a beautiful spirit with the God-given talent of dancing who went by faith and moved to L.A. to chase her dream of being a professional dancer. After only two months of living in L.A., Tsola's first professional live show was with N.E.R.D. She has also been featured in the "No Limit Remix" music video and worked alongside choreographers Willdabeast, Janelle Ginestra and Tyrell Washington for the Target commercial with Zedd, Maren Morris and Grey. 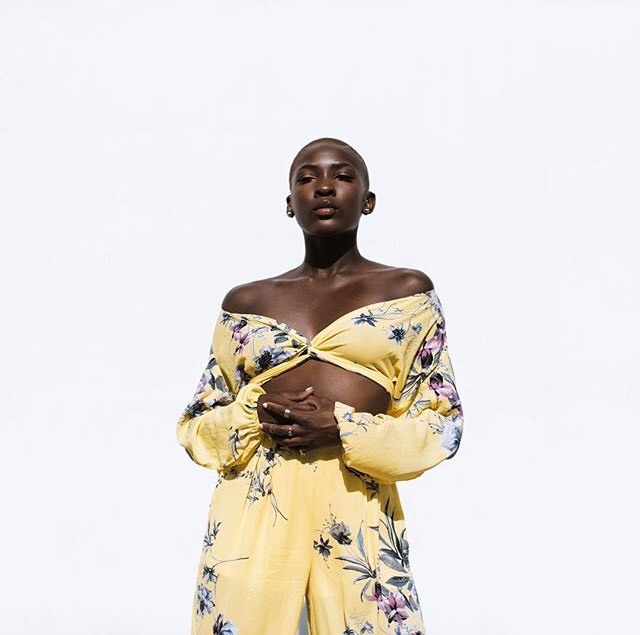 In this Q&A, she spills the truth about living in L.A., speaks on representation in the dance industry as a dark skinned woman and explains how her faith has played a huge factor in her journey. Ngozi Nwanji: For those that don’t know who Tsola Akuya is, introduce yourself. I first started dancing when I was in Kindergarten. I feel like I always tell people I started dancing when I was three, but I feel like when you’re in Kindergarten you’re about like five or six. So, I started dancing when I was about five or six and I never stopped since then. When did you know that dancing was more than a passion and was a career that you wanted to pursue? I knew that dancing was more than a passion when I took my first class. It’s something that I innately enjoyed. It’s something that my mom put into my life that I wanted to do even before I was put within classes. Mind you I’m like five or six and I would go home and practice, stretch, and practice my pirouettes. And, I’m like six. I barely even know how to spell pirouette now let alone being a child wanting to learn and just wanting to dance. I never thought about how dance could be my lifestyle literally now at my 21 years of age. Wow, kind of old. But, I just thank God that He literally planted that seed, my mom watered it and ever since then it’s been go time. You’re signed with Go 2 Talent Agency. Describe to me the day you were signed - the process, the emotions, everything. I did this program called Hollywood Biz and I did it with a few friends back from the DMV, you know us. The day was very calm. I really didn’t know what to expect. We came in and the owners of Go 2 came in, Lisa and Terry. They’re husband and wife and so lovely, so amazing. They talked to us and they were so great. Great energy, very relaxed. I didn’t feel nervous in regards to performing for them. But, I definitely felt nervous because I just didn’t know what the outcome was. I just really wanted to be signed so bad. So, one of the choreographers of the program taught us a piece and for some reason this choreography I was so tired. I don’t know why, but I think the adrenaline got to me because I was very fatigued. And, I really felt like my whole audition piece wasn’t my best dancing, but God saw it through for me. Getting signed, Lisa and Terry went there to announce it face to face, but the program director told us out of 19 people only the four of us got signed. And, I literally can’t even tell you enough about how my heart dropped and I almost was certain that I wasn’t getting a contract. Then, he called my name second and I literally just cried. I was just so overwhelmed because I didn’t think that this was going to be my portion, but God said otherwise. 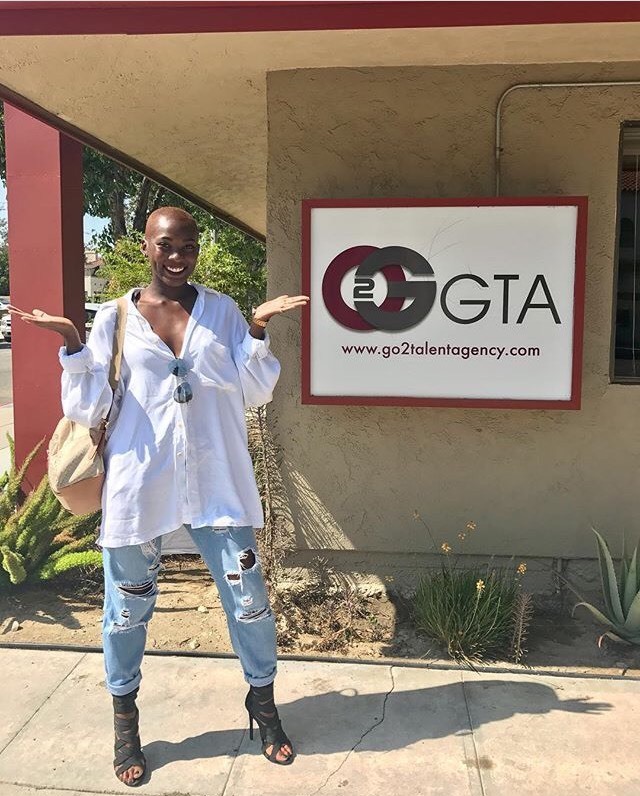 It was a very emotional and enlightening process of being a part of Go 2 Talent and I’m just very grateful to be a part of such a great establishment. What was running through your head the moment it truly set in that you were packing your bags and moving to L.A.? When I put my deposit down for the place I was living at and bought my plane ticket, I literally remember I was sitting on the couch with my mom and I started to cry. She was like, “Why are you crying?” And, I was like, “I’m just so happy!” It was just so funny and so dramatic for no reason. You work towards these things, even now I just feel emotional. These things we imagine in our heads that this is a dream, but the fact that it’s really not that far out of our reach, you know. And, who knew it would just be as much as investing into myself. We hear that all the time, but do we actually invest into ourselves and take the initiative? I think I took a pretty unconventional route. Like, you hear about people dropping out of college, but not really. I left school to move out to dance and that sounds pretty uncommon especially being an African-American. That’s pretty insane. I honestly wasn’t thinking about what people were judging, I was honestly just very excited. I didn’t really feel any nervousness until I got to L.A because the devil always tries to make you feel like, “You don’t have a job, you don’t have money”. But, God said otherwise and I really felt like the entire time I was very ready. So, the whole process was very calming, peaceful, joyful. I just felt so loved with all my loved ones and friends and it was just a really great feeling. How much of a culture shock did you first experience of being from the suburbs of Silver Spring, MD to living in a big city? To be honest, I really feel like L.A. is a lot like Silver Spring, MD. (Laughs) Well actually, I take that back. More so in regards to the vibe, because right now I feel like I live in not the suburbs, but kind of like in the mid-city I would say. People do consider this part the city, but it’s pretty calm. The neighborhood has a lot of families, kids and dogs, so I really feel like I’m at home. I think it was more of a culture shock when you’re stuck in traffic for like two hours, that was pretty crazy. I’m like, Ayo son, can you really accept this as our truth? Being in traffic for half your day? That’s pretty crazy. It also was very liberating because I’ve always been a city girl at heart. I feel like I get the best of both worlds because I feel comfortable in this suburban part I live in, but I also can be a train ride away and get to Downtown. It’s literally about the same thing as living in Silver Spring and going to D.C. for the day. It’s really not that big of a difference and I wish more people would see that it’s not that crazy except it’s just really hot all of a sudden and raining the next. What is one thing that people may not know about L.A? And, what have you had to learn the hard way about the city? I think people don’t know that L.A. can be as giving as it is and as selfish. L.A. has given so many opportunities and so much happiness. So much stability in regards to having a dance career, being that professional dancer I always dreamed of. It also has the ability that gave me loneliness, gave me some type of yearning to go back home and made me feel left out. It’s not always sunny. Actually, it really isn’t always sunny. It’s actually been very gloomy lately and it’s kind of scary. L.A. has a lot of opportunities and it’s a very populated city, but it’s a very lonely city of people. I feel like one thing I learned the hard way is that people don’t always have your best interest at heart. You just have to be super careful and I learned this the hard way about knowing who’s in your clique and knowing who’s trustworthy. Jealousy is a thing and sometimes it’s not always premeditated. Sometimes it’s a thing that naturally happens, but you just have to be very careful of who you’re talking to and information you’re sharing with people. And, who you’re letting into your personal space because it’s more than flesh and bones. It’s more of a spiritual battle that we’re going through and within this state you really have to guard your spirit. What does a day in the life of Tsola look like? I feel like naturally I wake up at like seven or eight now and it’s kind of annoying because I’m always tired sometimes. I always start my day in prayer. It doesn’t have to be super positioned, but I close my eyes and quiet my spirit. Thank God for waking me up. Pray for renewal, for strength and for anything that is negative in my soul to be ridden out of my spirit. Pray that my family and friends are okay. Then, I go and check my emails because you never know, there’s always something going on. I probably check Instagram to see what’s going on. I don’t know why, it’s kind of annoying sometimes. On Sundays when I have more time, I’ll go over my Bible because you gotta have the Word. Usually I have rehearsal and I’m in rehearsal pretty much all day. It’s literally like a 9-5. Then, you come back. Try to stretch. Take a shower. You talk to your roommates and then you start all over again. Usually when I’m feeling up to it after rehearsal, I go take class because I don’t want to go M.I.A in regards to the class scene. You gotta just love what you do more than be tired. When people think of Cali, they think of things like Disneyland & In-N-Out. Has there been something you always wanted to try there and discovered it’s overrated? Yeah, oh my gosh. Personally, this is just my personal opinion, but In-N-Out Burger. I did not like it. I randomly decided to take an Uber at like 8 p.m and was like, “Let me get some In-N-Out” because you know, everyone talks about it. Girl, it was just not good. The fries were just really soggy and I just really didn’t enjoy it. The burger was fine, but it was like any other burger. Respect to In-N-Out because the prices are great. I don’t think you’ll ever find that cheap of a meal anywhere else in L.A. which is probably another reason why it’s popular too. But man, I was just super shocked. I was like, people fly out to California for this? You might as well just go home and make a sandwich. Who is your favorite dancer of all-time? I don’t know if I have one favorite because there’ so many people who just make me want to dance and influence me. And, when they teach, choreograph or dance it’s just so inspiring to me. But, a few would be like Wade Robson, who literally started teaching at the age of 12 and was choreographing for Britney’s World Tour at the age of 16 whch is insane. He’s so amazing, groovy and passionate. We have people like Brian Friedman, who I look up to so much. His power, his strength and he’s such a kind soul it’s insane. One of my favorites as well is Richy Jackson, who I want to work with so bad and I know that we will meet. I think those are definitely in my top in regards to favorites, but there’s so many more that I don’t even know if I have a favorite. It’s just so impossible to pick. I want to play a little fun game where I give you two dancers and from the two you pick one. Paula Abdul or Janet Jackson? Oooh, Paula or Janet. Oh my gosh, first of all I don’t even want to pick because I feel like I’m gonna get my head chopped off regardless. But, I think I’m going to have to go with Janet. Definitely Janet. I think I relate more to Ciara because when she came out I was doing all her dances to her songs like “1,2 Step” “Like A Boy” and especially “Promise”. “Promise” was my favorite song and it still is now. Bruno Mars or Chris Brown? That’s really hard because Bruno Mars can really get down, but so can Chris. Oooh, that’s really hard! I don’t know, I don’t think I can pick with that. My mind wants to say Chris, but I feel like Bruno really be getting it. I’m just not gonna answer that one. Jade Chynoweth or Ysabelle Capitule? I don’t know about that one either. It’s because they’re both so different. Jade is really hard hitting and Ysabelle is just so swaggy and ooey gooey. I feel like in regards to me as a dancer, I’d definitely have to say Ysabelle. But, they’re both phenomenal it’s actually insane. Now, I want to get into representation in the dancing industry. As a young dark-skinned girl with a short cut, how has casting been for you? I feel like even before I came into the dance industry, I feel like when I first cut my hair and I was a dancer I felt very confident. I don’t know why, but I just felt like the weight was lifted off my shoulders physically and mentally. It was easier to dance because I didn’t have anything smacking me in my face. I really felt beautiful when I was dancing with my short hair. I don’t know if the Lord gave me this new profound confidence, but I really feel pretty confident and castings have been pretty amazing. But, I think what bothers me now is that for example, I have my short hair brown and it’s super cool because I can go for edgier jobs, but I can also go for commercial jobs. But, now my hair is white, so I feel like me being dark-skinned with a buzz cut and with white hair that it puts me in one category. I thank the Lord for putting me in different categories, so I can relate to each one and I’m not just stuck within one because there’s so many things I want to venture into. And, just because I look like that doesn’t mean I should be stuck here and that’s just the truth of the industry. Your look dictates your jobs. I never want to rely on my looks for booking things and I pray that’s just not always the case. I do thank the Lord that we have looks, but definitely want to look more towards talent. It’s just not a lot of girls with buzz cuts as I thought there would be. But, even then I just really feel like it’s a heart matter and the vibe and energy you give off really gets you a job or not. Another problem I have encountered is that it's hard being a Black girl because people don't always get how to do makeup for dark skinned women. You’re a Christian and a fearless woman of faith. How has your faith played a factor in your journey as a dancer? My faith is my dance career, honestly. Without God, I literally am nothing. I thank God for all my opportunities, I put Him first, I pray on everything from taking new career directions to auditions. I feel like the Lord was really preparing me because He had to get me alone and get my attention only. I had the attention of my friends, parties and other things that He couldn’t get to me. I feel like He really put me in this place where He could talk to me and let me know that He’s using me for something greater than I could even imagine. I thank God that it’s become more than a religion and it’s become a relationship and a partnership. Without it I couldn’t have possibly made it. It just wouldn’t have worked without God in the mix because He put that seed. He’s planted it in me. He’s using me, I’m His vessel and I do it for His Kingdom. I know that with Him by my side and us working together within this partnership for His good, I am literally like you said a fearless woman of faith and I’m unstoppable by His grace. Are you able to fill me in on any projects you’re currently a part of and working on? Usually I can’t speak on projects, but this one I feel like I can. I’m super excited to announce that I will be on Superfruit's tour as one of their dancers with Scott Hoying and Mitch Grassi! They are such phenomenal artists, singers, writers, people and friends. It just really has been a blessing working with them and I can't thank Lindsey B and Craig, the choreographers, enough for putting me on this tour. It is my first tour and it's a U.S tour, but we'll be going to some different countries as well. I just thank God for enlarging my territories and I know that it's going to be a crazy experience that will literally change my life forever. What advice would you give to someone who aspires to follow their dreams? I just really want to say to anyone who really wants to follow a dream that to not be afraid to take that first step. It literally was me moving to California with less than $2,000 in my bank account and just taking that leap of faith. It took years to know that dancing was for me and it took me wanting to stop dance before I knew that God was trying to get something to me. Once you understand that you’re called to do something, there’s no need to second guess it. Just do it! Whether that be drop that class or leave that school. Or, make that EP or write that song. Or, record that choreography. If you just start with one thing and you trust God, He opens the rest. It’s crazy when you think that everything’s going wrong and you say, “Lord, it’s in your hands” and you get that one radical email or thing that just changes your whole situation. And, that doesn’t just come to anyone. It comes to believers. Have the faith within yourself. Know that you’re worthy and that you’re good enough. Know that you have talent. And, rid yourself of any selfish ambition because we don’t do it for ourselves. We do it for our loved ones. We do it for our communities. We do it for the younger generations who look up to us. Just know that when you take that first step and you trust God every step of the way that you’re literally unstoppable. It's hard to believe that Kendra Oyesanya had no training growing up as a dancer. The energy she brings to her dancing is insane and each time she delivers like a professional who's been in the game for years. She goes to prove that some people learn their talent while some people are born with it and are destined for ultimate success. Her journey as a dancer began when she entered in Pepsi's 'Dance for a Chance' Contest for Beyonce in 2013. She won and flew to New York to film a super fan video with Beyonce's choreographer, Chris Grant. And, even had the chance to meet the Queen B herself! 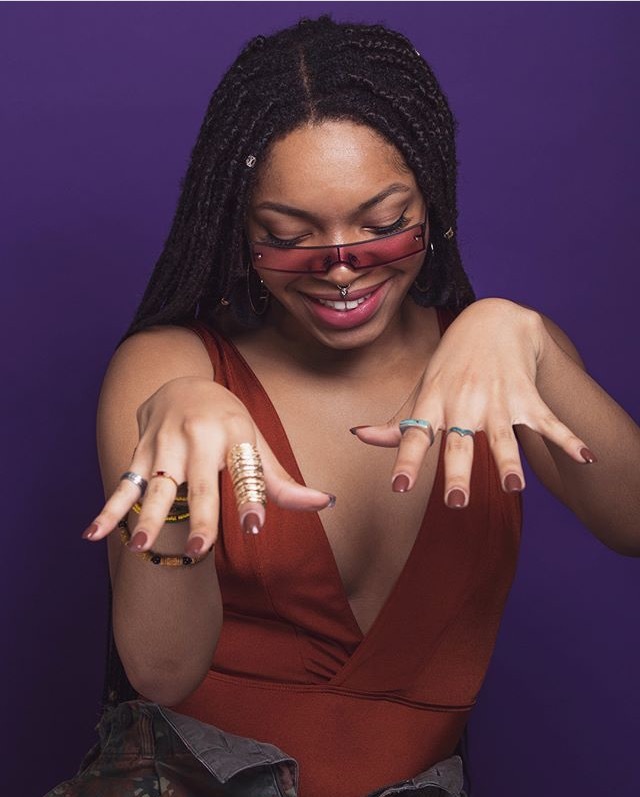 Grant pushed Oyesanya's hobby of dancing into a career when he told her that she should move out to L.A.
Oyesanya has worked alongside artists such as Diddy, Lil Kim, French Montana and Tinashe. She auditioned last year for the YouTube Red series, Step Up: High Water, and landed her first acting role playing Poppy Martinez. The creator and executive producer of the series, Holly Sorensen, made it known that she believed Oyesanya would blow up and be a fan favorite and her affirmations are holding true to their word. Oyesanya is known for her dancing videos on social media, but her most recent video of her and her friends take of The Black Panther Challenge has hit millions of views and gotten the attention of celebrities and blog sites like The Shaderoom. The video has been shared so many times that it has now even gotten on Good Morning America! 2018 has just begun and it's already looking to be a promising year for Oyesanya. Her story speaks to the important message of wholeheartedly believing in yourself, letting your hard work speak on its own and having your work take you places you thought you could only dream of. I believe the world will be seeing a lot of more of the crazy talented dancer. My Nigerian sister is going to be booked all 2018!